A rewarding, headache-free trip begins with being aware of a little about your destination. 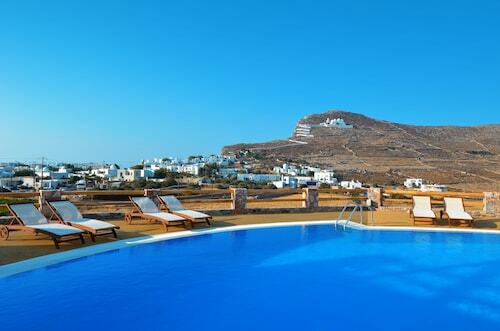 It's time to familiarize yourself with a few basic facts about Folegandros! 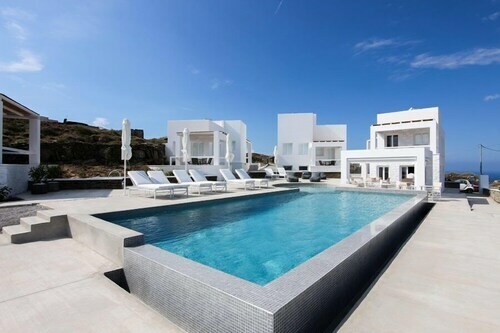 It lies in Greece, 35 miles (56 kilometers) from Paros. This part of Greece has a population of around 700 people, some of whom will surely be willing to provide you with some insightful travel tips. With no less than 400 airline partners and 665,000 places to stay, Travelocity can get you the cheapest prices on your Folegandros vacation. And how do we do that? We'll bundle your accommodation and flight bookings to save you cash! Are you looking for a stress-free vacation experience? Our Customer 1st Guarantee will provide you with 24/7 personal assistance on our services. If you discover an even lower price on another website, we'll refund the difference^. Alterations to package bookings will never incur any financial penalties from us. And as long as you get in fast, most accommodations won't charge you a fee either^. 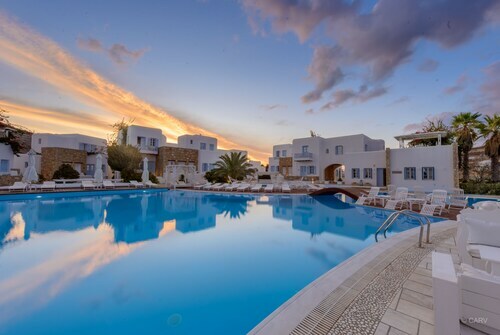 Be the early bird that catches the worm when it comes to booking your Folegandros accommodations. With 9 properties on offer, your options are somewhat limited. Start browsing and reserve the best room today! We're proud to recommend the Chora Resort Hotel & Spa and Anemi Hotel. 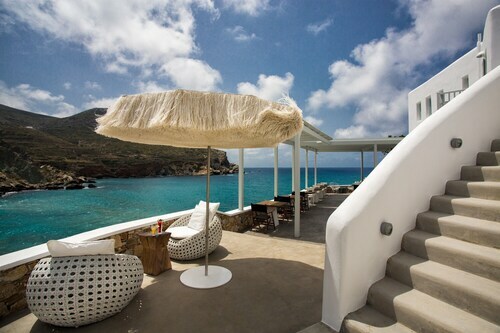 These Folegandros properties should satisfy most island vacationers. Where do you fly into for Folegandros? Stow your tray table, fasten your seatbelt and get ready to explore Folegandros! Once you disembark at Santorini National Airport (JTR), the lively main streets will be only 35 miles (56 kilometers) northwest from here. Can I rent a car in Folegandros? Forget the hassle of buses and pricey cabs. If you plan to do some serious exploring in Folegandros, it'd be wise to grab some wheels via Travelocity. We make it so easy that you'll be crafting the ultimate playlist in no time at all! Would you like to add some greater meaning to your getaway? Take yourself on a pilgrimage to Panagia Church. No matter what your beliefs, it's the perfect place to familiarize yourself with the local religion. Like some more ideas? 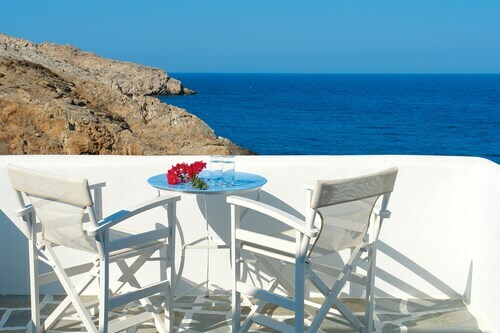 Find a safe vantage point and soak up the spectacular views on show at The Cliffs at Chora. But that's not all. Do you feel like a postcard-worthy afternoon by the water? Pack a camping chair and find the best spot to enjoy a stunning ocean sunset at Agkali Beach. Therasia is only 30 miles (48 kilometers) away from Folegandros. Make your way to this locality for convenient access to some excellent tourist attractions like the Archaeological Museum and the Museum of Prehistoric Thira. Santorini is one more destination to keep an eye out for. It's located just 35 miles (56 kilometers) away. If you take a day trip here, close by sights like Red Beach and Nea Kameni Volcano should most definitely be on your list. Situated near the beach, this eco-friendly hotel is within a 15-minute walk of Port of Karavostasi and Livadi Beach. Katergo Beach and The Cliffs at Chora are also within 3 mi (5 km). 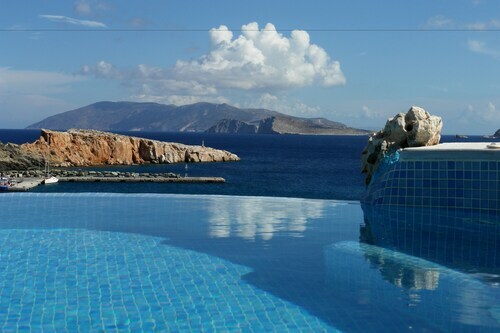 This family-friendly Folegandros hotel is located by the sea, within 1 mi (2 km) of Port of Karavostasi and Livadi Beach. Katergo Beach and The Cliffs at Chora are also within 3 mi (5 km). 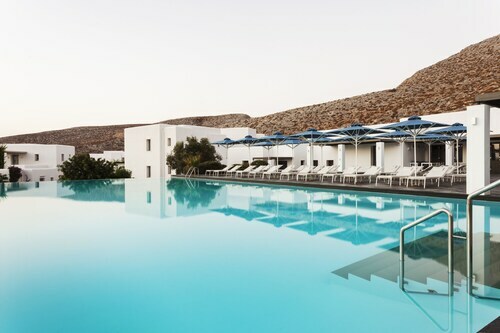 This family-friendly Folegandros hotel is located near the beach, within 1 mi (2 km) of The Cliffs at Chora and Panagia Church. Port of Karavostasi and Folklore Museum of Folegandros are also within 3 mi (5 km). Nestled on the beach, this Folegandros hotel is within 1 mi (2 km) of Agkali Beach and Folklore Museum of Folegandros. The Cliffs at Chora is 3 mi (4.7 km) away. 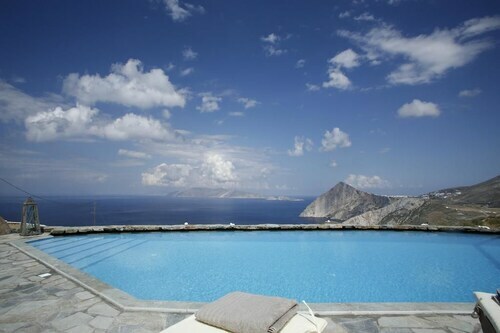 Situated in Folegandros, this romantic hotel is within 1 mi (2 km) of The Cliffs at Chora and Panagia Church. Port of Karavostasi and Folklore Museum of Folegandros are also within 3 mi (5 km). Situated in Folegandros, this aparthotel is within 1 mi (2 km) of Folklore Museum of Folegandros and Agkali Beach. Livadaki Beach and The Cliffs at Chora are also within 3 mi (5 km). Situated by the sea, this aparthotel is within 1 mi (2 km) of Port of Karavostasi and Livadi Beach. Katergo Beach and The Cliffs at Chora are also within 3 mi (5 km). Situated in Folegandros, this aparthotel is 1.2 mi (1.9 km) from Folklore Museum of Folegandros and within 3 mi (5 km) of Livadaki Beach and Agkali Beach. The Cliffs at Chora and Panagia Church are also within 6 mi (10 km).